So on Saturday, I ran my fourth half marathon. If someone told me about five years ago that I would type that sentence and it wouldn't be a joke, I still would have laughed out loud in disbelief. Jessica Miller and runner are words I thought would never belong together in the same sentence. But here we are, five years later. People ask me all the time why I run and how I run. First of all, I'm really slow. So it's not like I'm out there winning races and racking up prizes. But I still enjoy it and need it. Thus, this week's Tuesday ten is dedicated to the ten things I've learned through and gained from running. I'm not fast, but I can run for a while before I get tired, as long as I don't go too fast. The same is true in life. I can go for a while, but if I try to go too fast, I exhaust quickly. 2. Running is much more enjoyable when you start slow. Back when I first started running, I had to realize that you just can't go out and run ten miles. It's a process that takes time. Are you running (or trying to run) to lose weight? For your sanity? To take care of yourself? You've got to have a purpose, just like anything else you pursue in life. 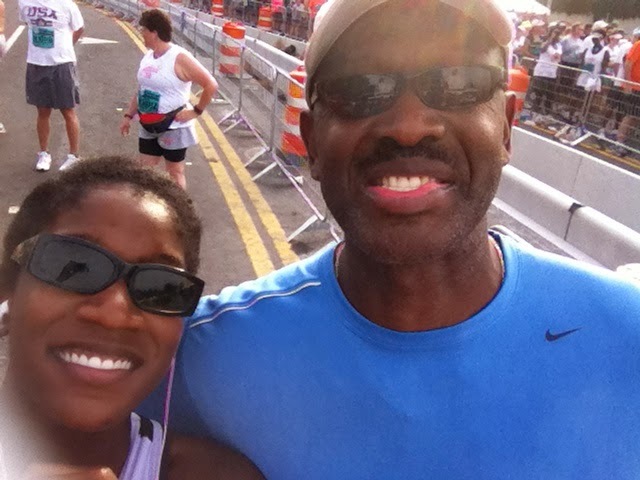 Before the Peachtree Road Race 2012 with my daddy. 4. Running is better with a soundtrack. My running soundtrack ranges from Jesus Culture to Justin Timberlake. It's all dependent on how I feel that day. The steady beat of the music helps me pace myself. Training for anything necessitates a plan. Just as Jesus said that a king must evaluate the cost of war and deliberate to understand his assets, so must a runner evaluate the plan needed to train and be ready for the race. 6. Running requires a loss of pride. I like to be good at things, and while I definitely would not consider myself to be a competitive person, I don't want to be last. So when I came to grips with the fact that I was not going to be as fast as my other friends, I was able to enjoy running much more. 7. Running brings strength to one's body. It is amazing to see what your body can do when you push it past your expectations. The very first race I ever did was a 5k, and I walked the whole time. Then I did a half marathon and ran (almost) the whole thing. I skipped the 10k stage. Go big or go home, right? 8. Running is great, but sometimes it's okay to walk. Sometimes you just need to slow down and listen to your body. It's that simple. Most runners will tell you that there is a definitive difference between a good pain and a bad pain. When you are truly struggling, just stop and walk. It's not the end of the world. 9. Running requires you to sometimes rely on others. You may have a situation where you do not think you can finish a race. You just cannot make it one more step or imagine running 1,2, or 5 more miles. Enter running buddy or BFF. Just the presence of a familiar friend can help you draw strength from a place where you didn't know you had it. 10. Running helps clear your mind and allows you to recognize your need for Jesus. I often run after work, because it allows me to decompress the day-the good and the bad. And when I do that, I can think so much more clearly and am able to gain the perspective I need-that I am not in control, but He is. And that is better than any runner's high. Therefore, since we are surrounded by so great a cloud of witnesses, let us also lay aside every weight and sin which clings so closely, and let us run with endurance the race that is set before us, looking to Jesus, the founder and perfecter of our faith, who for the joy that was set before Him, endured the cross, despising the shame, and is seated at the right hand of the throne of God.